Social Reading as a concept is arguably almost as old as the printed book. Once books didn’t cost an arm and a leg, it became a habit for people to make notes or annotations in the margins of the books they read and when others borrowed those books, they got a glimpse into what their friend was thinking about when reading a particular passage. In fact Scholia – the explanatory comments inserted in to the margins in ancient manuscripts – are important sources of information about many aspects of the bygone era. And its not just religious manuscripts that had notes. Arguably the most famous mathematical annotation was Fermat’s last theorem This scrawl in his copy of Arithmetica, circa 1637 had mathematicians scratching their heads for a very long time . Even Harry Potter benefited from the notes in Severus Snape’s copy of Advanced Potion-Making. Whether in mathematics or at Hogwarts, Marginalia has always been a literary pastime – albeit one frowned upon by book owners and librarians through the ages. But this habit is more symptomatic of the larger concept of ‘Social Reading’. With the advent of technology, reading has become an increasingly public act. Using the web and mobile devices people are turning to their friends and colleagues to share what they are reading and receiving feedback and comments about it. Instant online discussions spring up around topics that people have read, and links to related books and topics are shared. People are thus able to have a deeper and richer experience with the books they read. The conversations surrounding books they read are helping people to build connections and ask questions that often lead to exciting insights. Consider the example of a technology firm which hosted an open discussion forum about books that employees read. People could choose to have their reviews/comments viewed across the organization or among groups that they choose to make it visible to. A young intern in the organization had just finished reading a book on SDLC and didn’t quite get the need for it. To him, the process seemed more restrictive than useful and “coding-ninja’s” like him had better things to do – and he said so in the review comments he posted online. The conversation snowballed into an interesting exchange of thoughts across various levels in the organization culminating in the CEO joining in as well, putting across his thoughts about quality and reliability of deliverables to the clients. Without the social layer in the company, this conversation might have never happened and at the end of the day the learning was much more than what just reading the book might have given to all those who participated – not just the intern. The ‘social’ approach to reading is able to leverage the collective wisdom of all those who are interested in the topic and thus multiply the benefit of the book. It, in a way, allows others in join in on the journey along with the reader and together they uncover much more than any one person could have. Before technology enabled easy sharing of ideas around books and authors, book-clubs used to serve this useful function. Typically people who were interested in a topic or genre would gather at a fixed time in their local library or friendly neighbourhood book shop and spend a few hours poring over their impressions about a book, while sipping latte’s. Book-clubs were intimate affairs and rarely could one get a broader view. Not only that, often making it to the meetings meant keeping one’s calender free at a fixed time – a luxury – not often possible in today’s fast paced lifestyle. The new age social libraries (like ‘kwench), are able to blend the best of both worlds to making reading so much more meaningful. Book reviews, comments, questions can be placed online for peers to comment on and appreciate. Several online book-clubs get formed this way, when people with similar reading interests connect through the social platform – leading to new connections (and ideas) sprouting. When intelligent and like-minded people connect, things happen! And ever so often those ideas translate into a substantial contribution to the company’s bottom line. In the short term, technology helps to inject fun and engagement into reading. Personal dashboards let people keep track of the books they have read. You can set reading goals for yourself and mark the progress. Earning reading badges and subsequent appreciation from peers imparts a strong sense of satisfaction. On the other hand people like playing games and friendly competition keeps people hooked on to reading like nothing else. Apps today let you challenge your friends and colleagues to a reading-duel. Have a quick competition on who knows more about a book – ranging from Shakespeare trivia to who knows more about ‘Good to Great’ and earn unending glory among peers (biceps don’t matter any more). And there is no end to what’s possible. 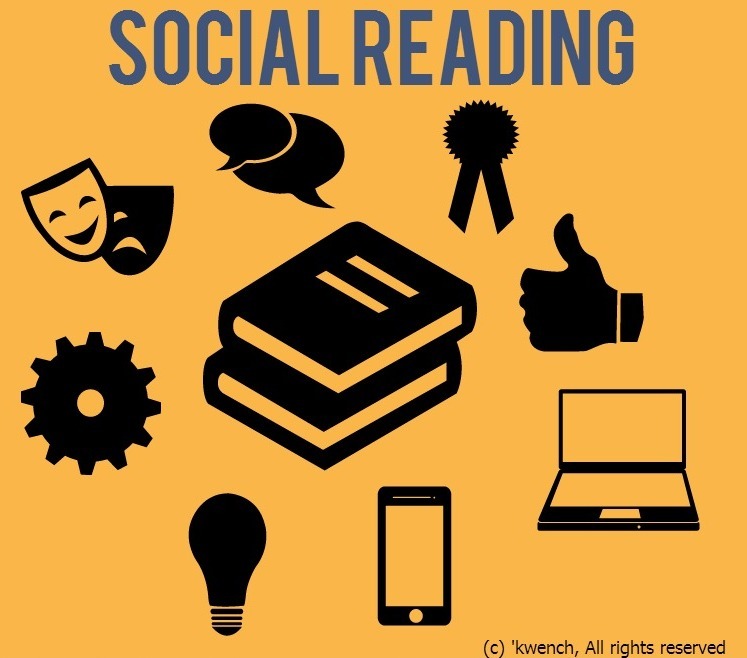 One of the inherent drawbacks cited when talking about online social reading connections is that a majority of people in these groups are silent participants – preferring to observe and follow conversations rather than initiate or participate. Forums and groups that give access to everyone on the web, while undoubtedly reaching a vast audience are also unable to auto-select members. Typically a group would have a large set of fence-sitters or people with a passing interest, and they would, quite understandably not participate actively in discussions or do so very rarely. This situation however changes dramatically in a corporate setting because topics being discussed are in the realm of peers. The discussions might have a direct impact on their professional life (as in the example of the intern above) and therefore is of more than just a passing interest to everyone. This situation thus makes social reading a far more engaging activity in the corporate setting. Libraries (and active reading) have always been an integral part of the workplace. Sometimes derided as just a place to store outdated manuals, libraries are now in a unique position to deliver real business benefits. Path-breaking companies encourage a combination of virtual and physical ‘social’ reading to foster a culture where employees connect across departments and teams. In addition to the obvious benefit of having a sharper and better informed workforce, this approach eventually gives rise to an environment of cooperation and innovation – something a company simply can’t afford to ignore in today’s marketplace. Image 2: Source: Wikipedia. 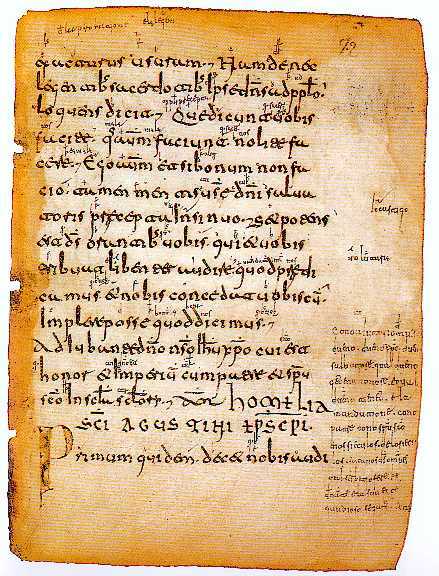 The image is an example of the Glosas Emilianenses which are glosses added to a Latin codex that are considered the oldest surviving phrases written in the Castilian language.